It's October, and that means…it's time for our annual costume contest! | Take Back Halloween! It’s October, and that means…it’s time for our annual costume contest! Hey, everybody! It’s time to put on your chitons and your corsets and get those cameras ready! Our 6th Annual Take Back Halloween Costume Contest is on. Send your photos to contest@takebackhalloween.org, and we’ll upload all the entries to our 2017 Costume Contest Album on our Facebook page. The deadline for submissions is 11:59 pm EST on Friday, November 3, 2017. As ever, we’re looking for costumes that fit into our own costume categories here on the website. That means a goddess or mythological figure, a great queen, a notable historical person, or a glamorous star. These should be specific people, not generic costumes. The categories are exactly the same as for the adult divisions, minus Glamour Grrls. Historical Recreation: This is for costumes that are based on an existing garment, statue, painting, description, or illustration. Examples might include: a replica of an archaeological find, such as the golden suit of Issyk; a dress based on a painting; a copy of a museum piece; or a costume inspired by an imaginative illustration, such as one of Mucha’s posters. The costume you’re copying or recreating should date from no later than 1950. Period Costume: This is for costumes that look as if they date from a certain period of history (though it’s fine to use modern parts and techniques in construction). Tudor England, Heian period Japan, Mughal India, Viking Age Scandinavia, and the American Civil War are just a few examples of costume periods. This category is ideal for those of you who are focused on recreating a style of clothing rather than dressing up as a specific historical person. The Masquerade Division is open to everybody, and if necessary we will definitely have separate prizes for amateurs, professionals, and juniors. The number of prizes awarded will depend on the submissions we get. 1. Except for the Masquerade Division, your costume must fall into one of our four categories: a notable woman from history, a queen, a glamorous star, a goddess or mythological figure. 2. Your entry photograph(s) should show the costume in full, and should be clear and well lit. Good photographs help the judging, so we suggest you try to avoid distracting backgrounds. 3. Please tell us exactly who or what the costume represents, along with your name. 4. 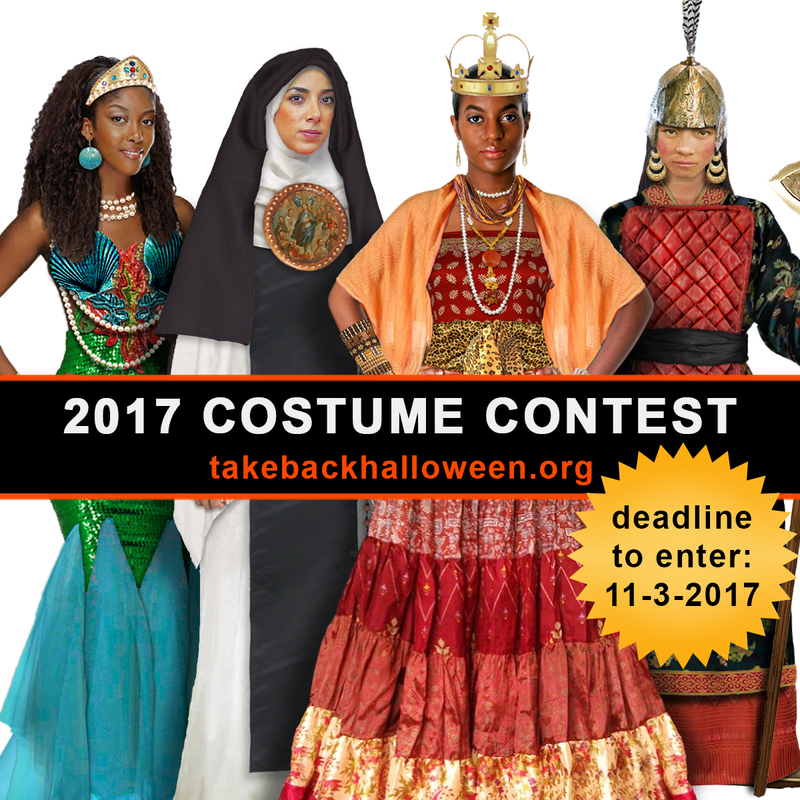 By submitting your photo, you are giving us permission to publish it on the Take Back Halloween website and on our Facebook page. You are welcome to send in multiple photos of the costume to help us see the full glory of the thing. 5. If you’re submitting a contest entry on behalf of someone else, you must have that person’s permission to submit the entry and publish the photo. If other people appear in the photo, you must obtain their permission for us to use and publish it. 6. The costume may be from any time in the past two years. 7. You may enter up to four (4) costumes for consideration. 8. Submissions should be emailed to contest@takebackhalloween.org. 9. The deadline for submissions is 11:59 pm EST on Friday, November 3, 2017. We expect to publish the winners the week after the submission deadline. Your costume has been exhibited at a cosplay convention or awarded a prize in a cosplay contest; it is a professional costume used for Renaissance Faire performances or historical reenactments; or it is a professional stage costume used for a theatrical performance. You are an expert or professional seamstress, cosplayer, Renaissance Faire performer, historical reenactor, or theatrical costumer, and the costume you are entering exhibits an expert skill level. If either of those applies, we’ll probably class your costume as a professional entry. © 2019 Take Back Halloween! All rights reserved.